I have always been an animal lover. Ever since I was little I wanted to adopt all the fluffy butts in the world. Growing up I was a cat person, then I got Oliver and now my heart just melts when I see a dog. I think I'm more excited about Oliver's first Christmas and the gifts he'll get more than my own this year. 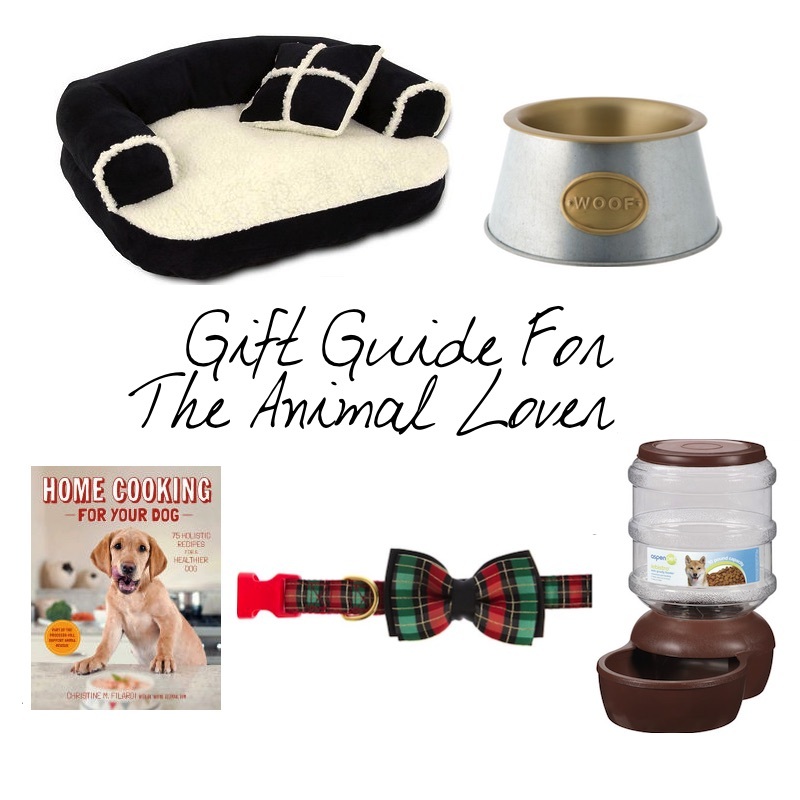 If you've got an animal lover in your gang, here's the perfect list of items to get them. One. Bow Collar // I am a sucker for a guy in a bow. These things are perfect for any pet too; cat, dog, or anything with a fluffy tail! Two. Jerseys // Yes, sweaters and shirts are cute (sometimes) but what is really cool are sport jerseys for pets. Omar is stuck in Japan which means I can totally get Oliver a Redskins jersey for the holidays! You can even get animal jersey's customized, my mom got her dog one and it's awesome! Three. Cookbook // Since I have my own place I find myself cooking a lot more. Anything I make, I have to make a dog version of it though. For instance if I'm having an omlette.. so is Oliver. It's important to know what dogs can and can eat, but if you get a dog cookbook you'll know exactly what kind of meals to prep for your pup. Four. Pet Bed // A pet bed can be a really expensive item, but if you know where to look it can be a good quality gift to get someone. We got a huge bed for Oliver at Ross for less than $40, but he's a monster and already destroyed it. Wouldn't mind if Santa brought him a new one! Five. Bowl Set // Bowl sets aren't expensive, but there are some really nice ones out there that would be a great gift set. Some pets have trouble realizing there's water in their bowl so those automatic water dispensers would be a fantastic idea. You could also get a matching or even personalized set. Six. Barkbox // I'm pretty sure I've talked about Barkbox before but I love this monthly subscriptino. It comes with a couple toys and bags of treats (all healthy) and whenever Smokey or Oliver see this box their tails wag like a crazy person, I mean dog, like a crazy dog. You can get someone one month, six months, or a full year subscription! Seven. Christmas Sweater // How great would it be if you got an animal an ugly Christmas sweater? Imagine the hilarious pictures that will be taken!? Eight. Treats & Toys // This one is super easy. Just make sure you get them healthy treats!